Seeking for ways outsiders can lead when our country is run by insiders and pay-to-play politics, Ennis, who The Washington Post called "an optimist at heart", journeys through high drama on the Ohio campaign trail, uncovers the secret history of America's past time, and explores the underworld of L.A. street art on an odyssey that reveals how much of a difference one person can make. 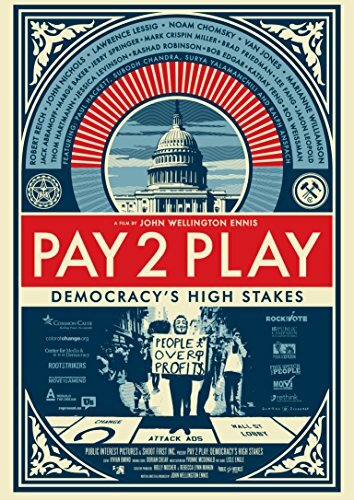 From billionaires meeting in secret to citizens taking to the streets, Pay 2 Play follows the money and connects the dots in this portrait of People Power rising. New York City-based TDC Entertainment is a diversified home entertainment distributor headed by longtime industry veterans Gary Baddeley and Dan Gurlitz. TDC combines the distinctive film collections of three label imprints: disinformation(R), True Mind and Shelter Island. With a focus on films that cover social, political and environmental issues, as well as subjects that range from ethics and health to personal growth and history, TDC's highly acclaimed library of films includes Robert Greenwald's political documentaries such as Unmanned: America's Drone Wars, Wal-Mart: The High Cost of Low Price and Outfoxed, the Emmy(R)-winning series Journey of the Universe, compelling issue-oriented docs including Tapped, Killer at Large, Greedy Lying Bastards and Unacceptable Levels, as well as the best-selling Parents Choice Award-winning instructional series, Drawing with Mark. For more information, visit TDCent.com.